Won for Best Score-Miklos Rozsa. Nominated for Best Picture; Best Director; Best Supporting Actor-Michael Chekhov, Best Cinematography; Best Special Effects. As I occasionally allude in my reviews, in my “real life” I work as a psychologist. This means I find myself particularly interested in movies that take a look at the profession, especially as a way to examine past theories. Psychology remains a fairly new field of study, and ideas change quickly; I’m sure that 50 years from now, many of the concepts we currently hold true will look silly. For proof of this, one need look no further than 1945’s Alfred Hitchcock thriller Spellbound. This flick touts the wonders of psychoanalysis. In fact, a title card espouses those methods in this way: “Once the complexes that have been disturbing the patient are uncovered and interpreted, the illness and confusion disappear… and the devils of unreason are driven from the human soul.” Though those concepts have generally fallen out of favor over the ensuing decades, back in that period, many held these notions to be true. Unfortunately, Spellbound concentrates too strongly on the wonders of psychoanalysis. The film promotes the glories of those methods to such a degree that it actively mars the story. This relegates Spellbound to the realm of second-rate Hitchcock, unfortunately. While the movie certainly features some good moments, its heavy concentration on an unrealistic depiction of psychotherapy harms it. Spellbound initially takes place at the Green Manors psychiatric institute in Vermont. Longtime chief Dr. Murchison (Leo G. Carroll) gets the boot due to age and a recent minor breakdown, and Dr. Anthony Edwardes will soon arrive to take his place. In the meantime, we meet Dr. Constance Petersen (Ingrid Bergman), an educated and insightful psychiatrist who seems cold and detached from most people; she clearly doesn’t know much about the ways of love! When Edwardes (Gregory Peck) arrives, this changes. He and Constance quickly develop a whirlwind romance, but things take a turn for the worse when we learn that matters aren’t what they seem. We learn that the new doctor isn’t actually Edwardes; the imposter remembers little about his past other than his initials as “JB”. He also believes that he murdered the real Edwardes, but Constance can’t imagine that the man she loves could do such a thing. From there she decides to use the wonders of psychoanalysis to get to the bottom of things and save JB. Unfortuately, others also discover that JB isn’t Edwardes, so he goes on the lam. Constance follows him and the two spend much of the film on the run as she attempts to delve into his mind. At its heart, Spellbound enjoys a good story and a clever viewpoint. The tale doesn’t seem tremendously original as JB slowly uncovers his past, but the attempt to do so through psychology appears interesting. 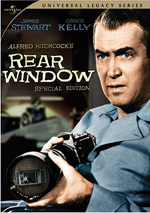 Hitchcock unfolds the plot in a nicely taut manner for the most part, and the story moves along well much of the time. However, the use of psychoanalysis bogs down these elements. At times Spellbound feels like a propaganda piece that sings the glories of that method. Granted, the movie occasionally casts some doubts about the program’s usefulness, but the techniques prove successful in the end, so Spellbound seems to strongly praise the format as the magical way to solve all of life’s problems. Admittedly, people thought that way at the time, but this still comes across as unrealistic and silly. Without that side of the film, Spellbound might have worked better, but those parts fill a lot of the piece, so they remain an inherent flaw. The acting seems fairly average as well. 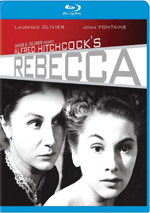 Bergman appears acceptable as Constance, but Peck comes across as somewhat too stiff and banal as JB. He doesn’t strongly communicate the demons in his character, as he appears moderately lifeless and drab. He and Bergman don’t connect terribly strongly as a couple either; I didn’t get a great sense of their chemistry. Spellbound does enjoy a tight climax, and I also think it provides some wonderfully irreverent moments during which real life intrudes on the story. For example, while Constance waits to find JB at a hotel, a schlub from Pittsburgh hits on her. That bit has little to do with the story - though it does introduce the hotel detective, who plays a small part - but it nonetheless works because it seems amusing and real. I also like the bland banter between a pair of cops as they wait to chat with Constance’s former mentor; those touches of real-life add spark to the project. Otherwise, Spellbound feels like below-average Hitchcock. The movie enjoys enough successful moments to merit a look, but the heavy emphasis on the glories of psychoanalysis make it a chore to watch at times. Spellbound appears in an aspect ratio of 1.33:1 on this Blu-ray Disc. This was a good presentation for an older film. Sharpness seemed decent but a little inconsistent. Most of the movie remained reasonably crisp and detailed, but softness intruded at times. Some of this appeared to result from Hitchcock’s photographic techniques - he always loved the soft-focus, especially for his leading ladies - but not all of the examples seemed to come from that tendency. Still, overall clarity was quite good. No instances of jaggies or moiré effects appeared, and I noticed no edge haloes. Print flaws weren’t a concern. I noticed a couple of tiny white specks but nothing more, and the film exhibited a nice level of grain. A few shots seemed slightly flickery, but those were minor. Black levels came across as fairly deep and dense, while low-light situations seemed reasonably clear and accurate. Contrast tended to be positive for the most part; a couple of shots looked a wee bit too bright, but again, those were brief and pretty insubstantial. I thought the movie looked good to terrific most of the time. Overall, the monaural soundtrack of Spellbound seemed fine for its era. Dialogue sounded clear and relatively warm. I never experienced any trouble understanding lines, and I noticed no concerns related to edginess. Effects came across as thin but reasonably accurate, and I discerned no issues caused by distortion; those elements lacked much depth but they seemed acceptably full considering their age. Music also appeared clear and distinct; the score bordered on shrill a couple of times but never got there. No noise concerns marred this clean track. Nothing dazzled, but the mix was perfectly acceptable given its age. Expect a good roster of supplements here. We open with an audio commentary from author/film professor Thomas Schatz and film professor Charles Ramirez Berg. Both sit together for this running, screen-specific look at story and script, cast and crew, cinematography and visuals, symbolism, and a few other issues. At its best, this chat covers the film fairly well. However, it can drag a bit at times, and I think it focuses a little more on interpretation than I’d like; I’d prefer a commentary with a bit more about the production itself. Still, it delivers enough useful information to be worth a listen. Three featurettes follow. Dreaming with Scissors: Hitchcock, Surrealism and Salvador Dali goes for 20 minutes, 21 seconds and offers notes from The Hitchcock Romance author Lesley Brill, Los Angeles County Museum of Art assistant curator Sara Cochran, Dali, Surrealism and Cinema author Elliott H. King, author/film historian Bruce Scivally, UCLA French Film Studies assistant professor Laure Murat, filmmaker Peter Bogdanovich, UCLA film professor Jonathan Kuntz, Hitchcock and Selznick author Leonard Leff, Hitchcock at Work author Bill Krohn, film scholar Royal S. Brown, actress Rhonda Fleming, Alfred Hitchcock and the Making of Psycho author Stephen Rebello, and Showman: The Life of David O. Selznick author David Thomson. We learn about Dali’s life and career as well as his collaboration with Hitchcock and work on Spellbound. This includes a look at original plans for the dream sequence that didn’t come to fruition. Though a bit dry, the program covers the appropriate bases and gives us a concise overview of the topics. Guilt By Association: Psychoanalyzing Spellbound lasts 19 minutes, 39 seconds and provides info from Kuntz, Rebello, Thomson, Schatz, Bogdanovich, novelist/film historian Raymond Benson, therapist Jean Brown, Hitchcock as Philosopher author Robert Yanal, film historians Scott McIsaac and Rudy Behlmer, cinematographer Nance Jordan, National Veterans Foundation president/founder Shad Meshad, and Professor of Clinical Psychology Dr. Don Catherall. “Guilt” looks at how WWII affected the public’s interest in psychoanalysis, its development in the era and its use in the film. The show focuses less on Spellbound than I’d like, but it still offers some interesting notes. For the final featurette, we get the 10-minute, 10-second A Cinderella Story: Rhonda Fleming. It features Fleming as she discusses her entry into show business, working on Spellbound, Hitchcock and her co-stars, and other aspects of her career. Fleming provides a brisk, enjoyable look at her life in film. Under 1948 Radio Play, we get an adaptation of Spellbound from the “Lux Radio Theatre”. The show itself lasts 59 minutes and 47 seconds and stars Joseph Cotten and Valli in the lead roles. Of course, it condenses the story to a great degree, but it offers an interesting though melodramatic rendition of the tale. In addition to the film’s trailer, we get an audio interview with Alfred Hitchcock. 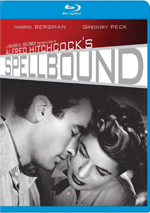 Conducted by Peter Bogdanovich, this 15-minute, 21-second clip looks at aspects of Spellbound’s creation and filming as well as other aspects of Hitchcock’s work and career. 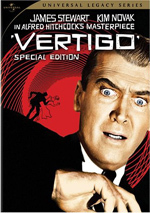 Bogdanovich records lousy audio commentaries, but his Hitchcock interviews offer good insights, and this is another solid one. Unfortunately, I didn’t think that Spellbound provided one of Alfred Hitchcock’s stronger works. Though the movie had its moments, I felt that it seemed silly and indulgent overall. The Blu-ray provides good picture and audio along with a nice set of supplements. While I’m not wild about the film, the Blu-ray treats it well.